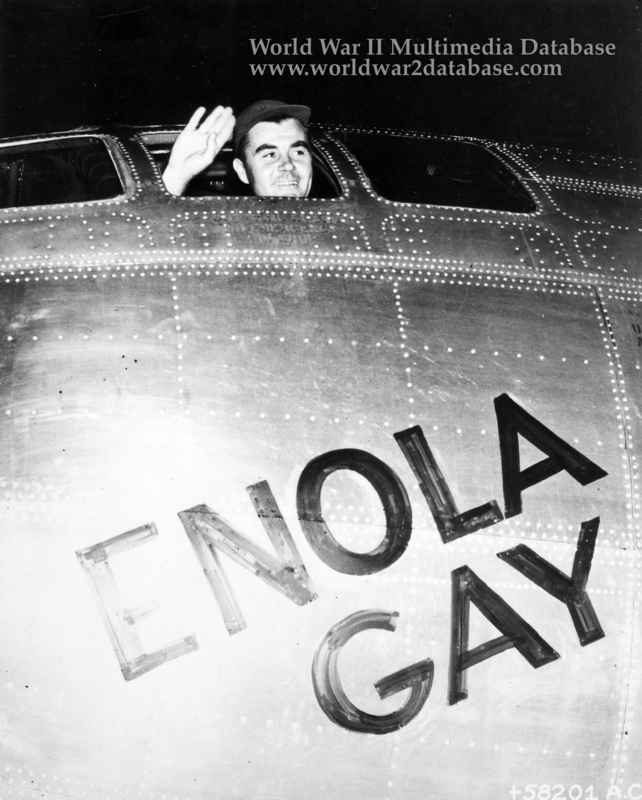 Colonel Paul W. Tibbets, Jr., commander of the 509th Composite Group, waves from the Enola Gay (B-29-45-MO Superfortress, serial number 44-86292, victor number 82) at 0245 Hours on August 6, 1945 prior to takeoff. Enola Gay was assigned to the USAAF's 393rd Bomb Squadron, 509th Composite Group. The plane was one of 15 B-29s with the "Silverplate" modifications necessary to deliver nuclear bombs. A Boeing design, Enola Gay was built by the Glenn L. Martin Company at its Omaha, Nebraska, plant and personally selected by Tibbets on May 9, 1945 while still on the assembly line as the B-29 he would use to fly the atomic bomb mission. The airplane was accepted by the USAAF on May 18, 1945, and assigned to Crew B-9 (Captain Robert Lewis, aircraft commander), who flew the plane from Omaha to the 509th's base at Wendover Army Air Field, Utah, on June 14, 1945. Thirteen days later it left Wendover for Guam, where it received a bomb bay modification, and flew to Tinian on July 6. It was originally given the victor number 12 but on August 1 was given the circle R tail markings of the 6th Bomb Group as a security measure and had its victor changed to 82 to avoid misidentification with actual 6th BG aircraft. After flying eight training missions and two combat missions during July to drop pumpkin bombs on industrial targets at Kobe and Nagoya, Enola Gay was used on July 31 on a rehearsal for the actual mission, with a dummy Little Boy assembly dropped off Tinian. On August 5, during preparation for the first atomic mission, Tibbets had the plane named after his mother, Enola Gay Tibbets. Captain Lewis was unhappy to be displaced by Tibbets for the important mission, and furious when he arrived at the aircraft on the morning of 6 August to see it painted with the now-famous nose art. Tibbets himself, interviewed on Tinian later that day by war correspondents, confessed that he was a bit embarrassed at having attached his mother's name to such a fateful mission.